The PKI 9810 is an inexpensive kit designed for IED search operations. 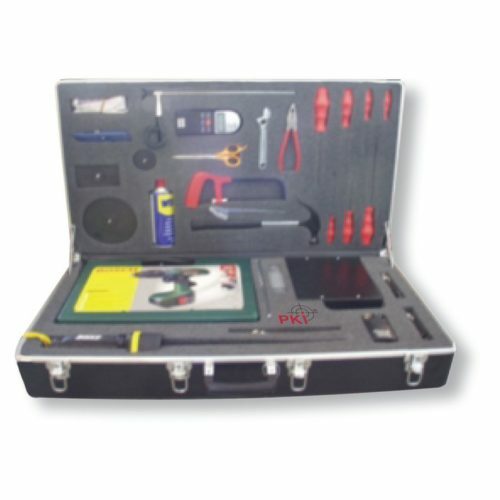 It provides a range of tools for carrying out general searches in buildings, ships and vehicles and contains a portable endoscope/boroscope, a portable hand lamp, a portable drill as well as an assortment of tools. Whenever immediate visual inspection behind walls and panelling is required, the portable drill enables inspection via holes to be drilled through all types of material, allowing rapid internal and visual inspection by means of the supplied endoscope and hand lamp. Large and small inspection mirrors are also included to facilitate searches in confined spaces. The kit furthermore provides a range of tools for removing panelling and covers and is suitable for carrying out general searches in vehicles and ships as normally having to be done by customs authorities. Mirror to fit telescopic pole – 63.5 mm diam. Dental mirror – 22 mm diam.